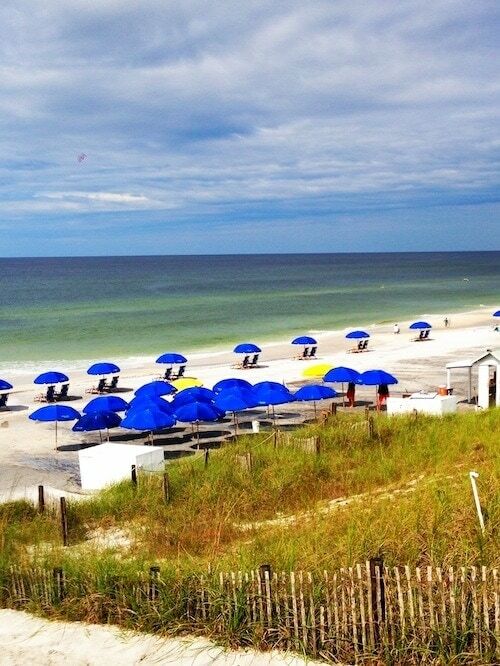 Seaside, Florida is the perfect place for a relaxing beach vacation! 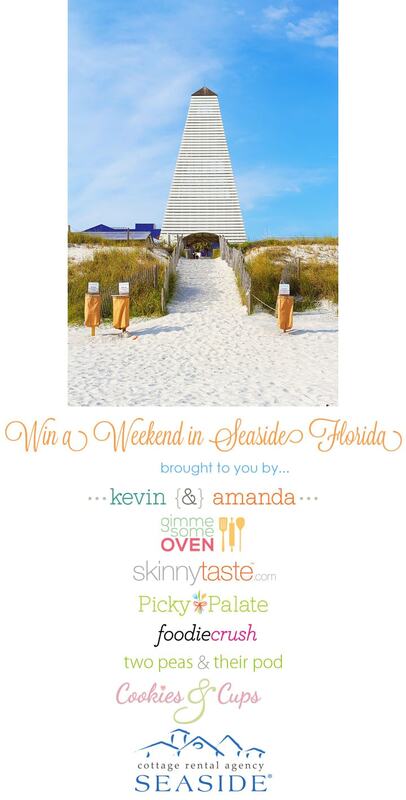 Enter to win a fun Seaside giveaway! 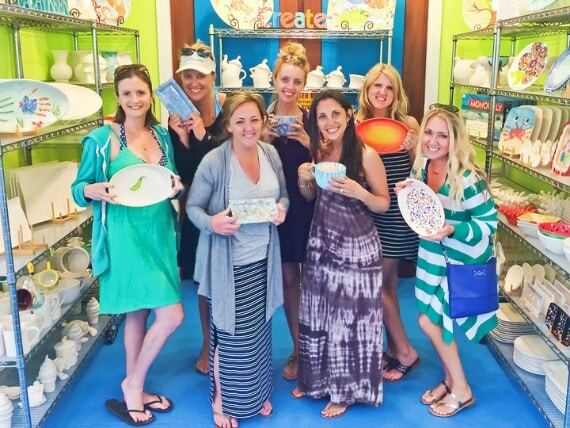 A few weeks ago, I went to Seaside, Florida for a girls weekend with some of my favorite blogging friends. 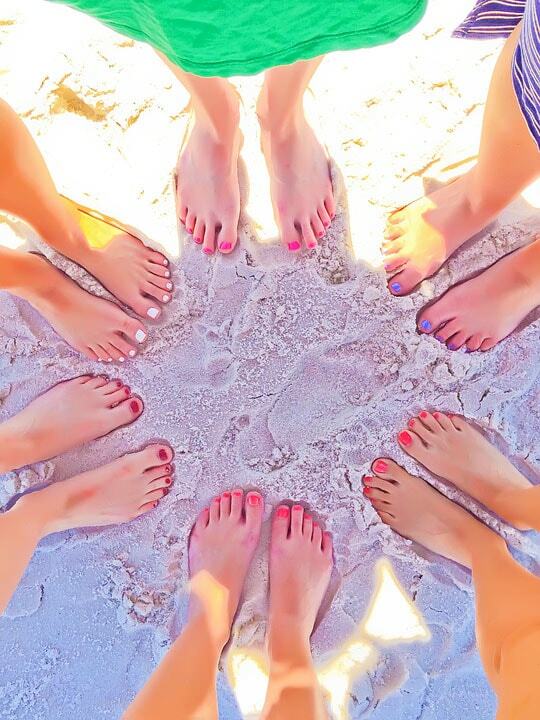 We relaxed on the beach, soaked up the sun, talked about girly things, and ate our way through Seaside. It was the perfect weekend! Today I am sharing some fun photos from our trip AND we have a fun Seaside giveaway! 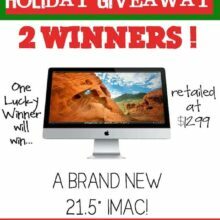 Make sure you keep reading so you can enter! I’ve been to Florida several times, but never to Seaside. Seaside is the cutest beach town. The houses are adorable and the people are extremely friendly. It is easy to get around and the shops and restaurants are so fun! 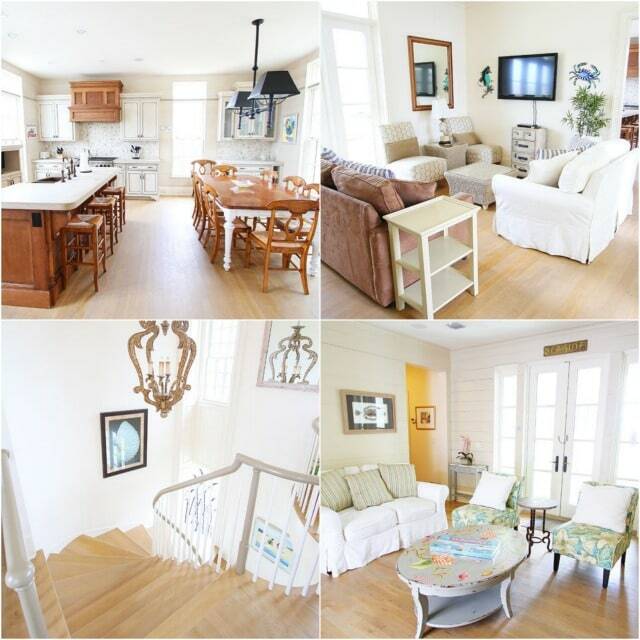 Cottage Rental Agency provided us with a beautiful beach house called the See Ya Cottage. It was three stories and right on the beach! I had a great view of the ocean from my room! I loved being steps from the beach! I loved getting my feet in the warm sand! We went to Fired Up to make pottery. I am not the most artistic person, but it was fun and I was pretty proud of my pea pod dish! 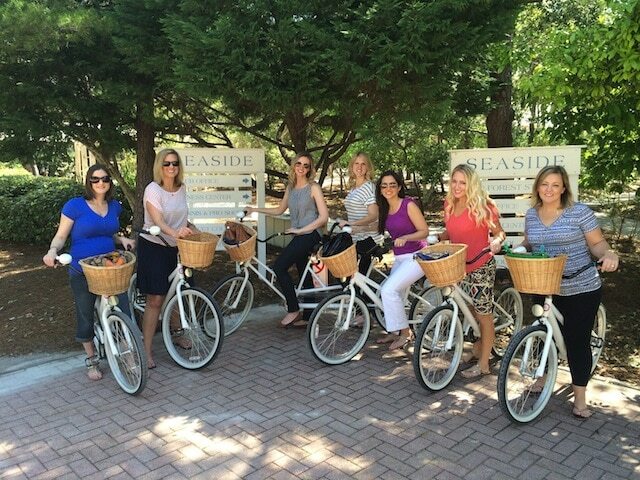 We took a little bike ride around Seaside! We saw the famous house from the movie The Truman Show! All of the houses are adorable! We spent a lot of time with Bill and Heavenly! They are the owners of several restaurants/shops in Seaside. They are the nicest people and the cutest couple! 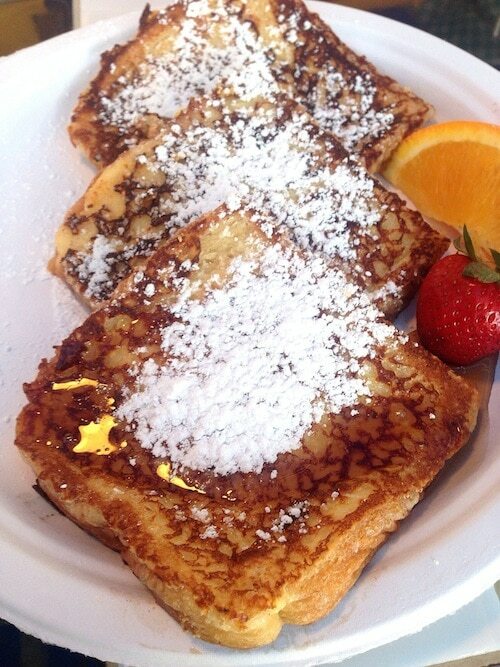 Heavenly’s French toast from Pickle’s was my favorite eat of the trip. The secret? She makes the French toast with ice cream! No wonder it is heavenly. 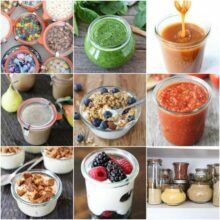 I think I need to recreate this recipe at home! We visited the Farmers Market on Saturday and sampled lots of yummy treats! 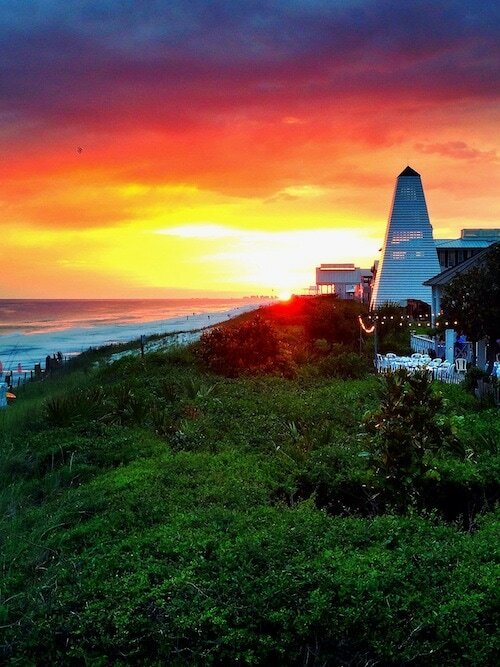 The sunsets in Seaside are breathtaking! Every night we were blessed with a gorgeous view! 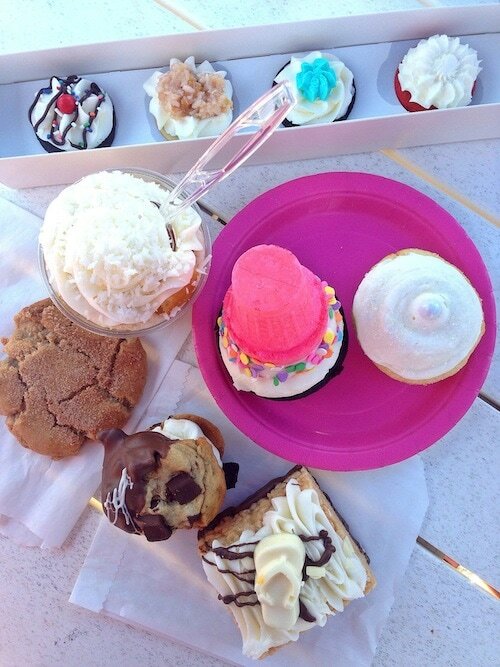 Gelato on the beach is a must! We spent a lot of time hanging out at our beach house! Don’t worry, we really didn’t work that much! 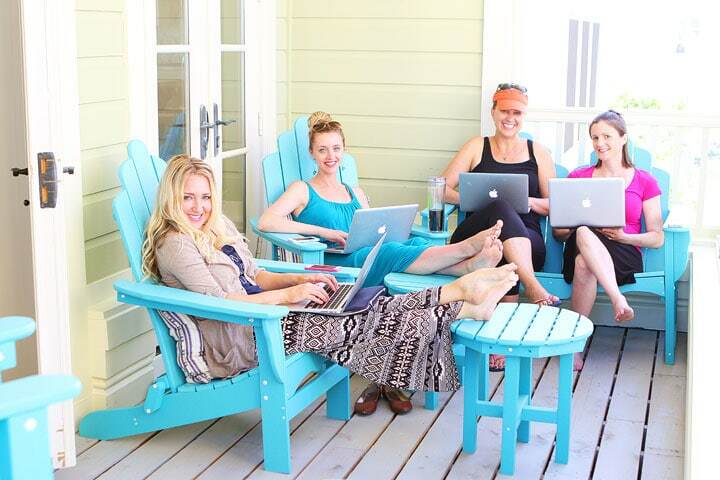 We had to have a few blogging sessions though:) I wish I could work with my friends on the porch every day! 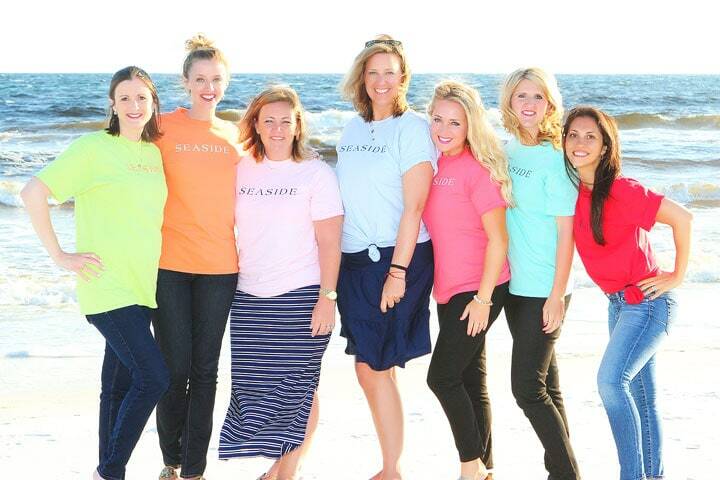 Loved my time on the beach with Ali, Shelly, Heidi, Jenny, Amanda, and Gina! Thanks Seaside for a fabulous weekend! I left relaxed, sun-kissed, and very full. 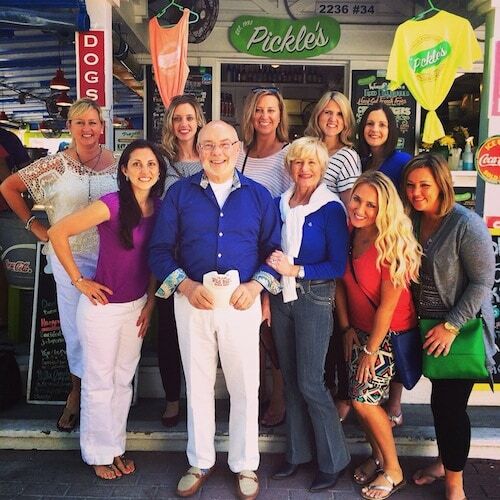 Seaside spoiled us with good food! You can check out more of my trip photos on Instagram! And now for an exciting giveaway! Today we are partnering with Seaside and Cottage Rental Agency to send YOU and your friends on your own 3 day, 2 night getaway to Seaside!! 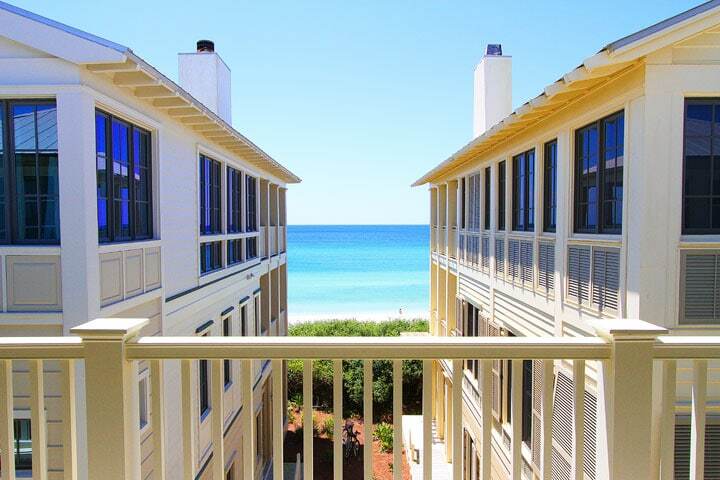 One lucky winner will receive a 3-day, 2-night stay in a 3-bedroom Cottage (sleeps up to 5) from Cottage Rental Agency in Seaside, Florida. To enter , use the PromoSimple Widget below. *Lodging certificate valid 8/17/14 – 12/20/14. 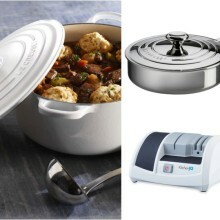 Subject to availability; not available during major holiday or major event weekends; additional restrictions may apply. Cottage Rental Agency provided a beach house for our stay and Seaside treated us to several meals and activities, but we paid for our own travels. All opinions are my own! What a wonderful weekend away. I am thinking come next winter this is exactly what I will need. How beautiful! I need a vacation so badly for my family and I after making it through a very rough tax season. 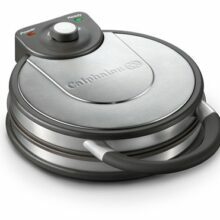 This looks like it’s exactly what we need! 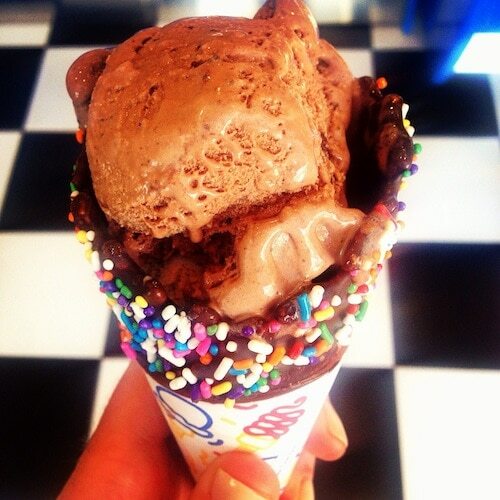 Seems like a little slice of heaven, no calories! I have never been to Florida, what a wonderful vacation it would be! Seaside looks like a beautiful and relaxing place! This would make for a much needed getaway with friends! What fun!!! Your pics definitely make me want to go. This would be such a fun trip with my mom and sister. What a perfect getaway with friends or family!! Sounds like this would be a perfect vacation! You lucky girls. How wonderful! I loved your pics. Have a great weekend. A weekend at the beach sounds like perfection! I have been wanting to go to Seaside for some time! Great post… definitely made ME want to go! 🙂 My daughter just got married in January and she and her new hubs are living in Savannah, GA. My son and his bride of 2 years and my hubs and I live in Tuscaloosa, AL and I had recently been contemplating where we could meet to have a get-together at the beach. This sounds like a possibility! Will HAVE to check out Pickle’s if we go!!! Would LOVE to enter the contest and enjoy a few days like y’all by the beach but I cannot het to the entry form. 🙁 It keeps spinning & says, “one moment please, entry form is loading” but sadly no load-Is there an alternate way to enter? Thanks! What a wonderful opportunity. I love the sea and I love Florida but haven’t been back since before my husband passed. I have never been to Seaside. It looks wonderful and I would so enjoy spending some time there exploring and sitting on the beach. Never been to Florida but Seaside looks like the cutest!! I would love to lay out on the beach tanning, and listening to music all day! Looks awesome! Would love to spend some mother and daughter time at Seaside. Who’s ready to go back? Me! Me! Me! Just the pre-trip for your Hawaii trip! Yes, please! Would love to visit Florida!! Would love to visit Seaside, have had othere relate great experences when visiting there. Would love to win this. Sincerely. I’m too far away (in Portugal) but your photos make me want to visit. You have a beautiful blog too, I will follow closely. I loved the photos, they are beautiful! I wanted to visit the Florida coast too! Made Me wish very much this place!